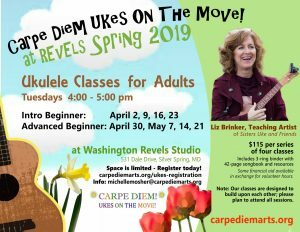 Learn how to play the ukulele in these classes offered in partnership with Carpe Diem Arts and Revels! Both the Intro Beginner and Intermediate Classes are for adults and are led by teaching artist Liz Brinker of Sisters Uke & Friends. Intro Beginner Classes are designed for those with no previous experience with the ukulele. Students will learn 4-5 basic chords, several strum patterns, and songs from many traditions. Advanced Beginner Classes are designed for those who have completed our Advanced Beginner Classes or an equivalent. Students should be able to move comfortably between the C, Am, F, Fm, G, Gm, C, Cm, E, Em, D, and Dm chords; sing along while playing the ukulele; and have mastered several strum patterns. In this class, students will learn more songs containing 4-7 chords, experiment with singing in harmony, and more! For more information, email michellemosher@carpediemarts.org. TUITION: $115 per series of 4 classes. Includes 3-ring binder with 42-page songbook and resources. Register Today!. Some financial aid available in exchange for volunteer hours.